See up-to-date repair and alignment service photos in the shop! Facebook makes it hard to see pictures without first logging in. Download the browser plugin "uBlock Origin" to stop this nonsense. 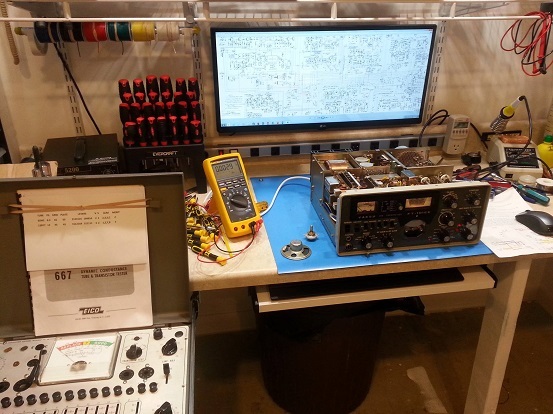 Here are a few photos showing the service bench area and some of the radios being serviced. 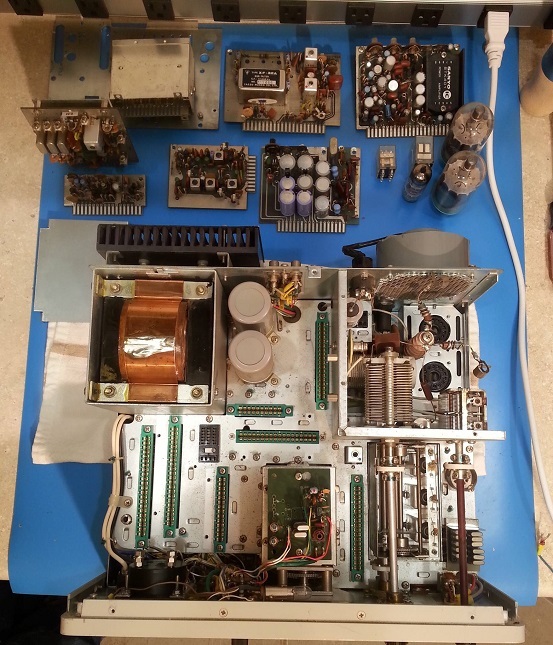 Everything in these photos are dedicated solely to the repair and alignment of the original FT-101 series radios. You will also notice that there are no paper schematics. Everything has been scanned into PDF or JPG files. I scan scroll, zoom, annotate, or color-code to match the chassis wiring. The EICO 667 tube tester provides instant health and operating performance of the tubes inside the radio. I try to find parts that are FT-stylish and prototypical for the era of the radio. I am not bottom fishing for parts on the big-3 web pages. You deserve better! I am the owner and a client. Yes, those are my radios in the top panel. A clean bench is a sad bench- Ready for another FT-101 alignment! L-R: 132 Parts Bins, EICO 667 Tube Tester, colored spools of wire for exact-match repair, hands-free solder stand, calibrated Fluke meter, FT-101 specific tools and pliers atop a static-safe and scratch-resistant pad, 31" color display for all schematics, fresh Kester solder/rosin products, grounded variable-heat soldering station, and a vacuum powered de-soldering station. 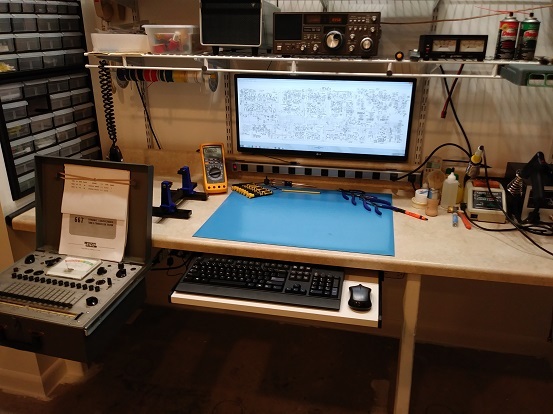 Not shown: Variac, Motorola R2004D Service Monitor (1GHz), Tektronix O-scope (100 MHz), hot air re-work station for softening 43-year old waxed slugs, Yaesu factory Board Extenders, etc. The Yaesu FRG-7700 receiver lets me listen to the HF Band activity that I am missing while I work on your radio! The Yaesu SP-101 speaker lets me troubleshoot your internal speaker and listen to the fantastic audio originating from the FT-101. The hanging factory microphone allows factory-level audio into the radio- along with proper VOX and PROCESSOR settings. A J-38 Key allows CW testing and side-tone levels to be set. I also have the Yaesu YD-844 desk microphone, Turner SuperSidekick, and D-104 microphones. I've got you covered! 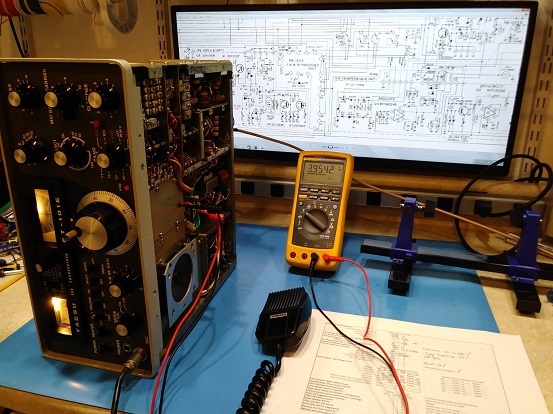 Here is a Classic FT-101 on the bench. After 43 years, the Main VFO was slipping- making it hard to fine-tune a distant station on SSB. This requires replacing the Jackson Ball Drive with the proper 6:1 ratio. Replacements are only available in the UK and requires a few days to obtain. I must buy in small quantities to justify the high shipping charges. A blown speaker was also needed. Although the FT-101 has a built-in downward-firing speaker, I always suggest using a remote speaker- especially the matching Yaesu SP-101 or SP-101PB with telephone patch. The FT-101 has more audio richness than a 3" speaker can ever reproduce. You are missing out so much. This is what I mean when I say: "I will be deep inside your radio like never before- not since it left the Yaesu factory." In 30-minutes, your radio will look like this... Your FT-101 is completely taken apart, cleaned, inspected, and reassembled. I follow a 6-page checklist that is logically organized to check everything in the radio at the right time, in the right order, and at the right temperature. Hint: The power supply and voltage rails are first. The power supply must be rock solid. Tubes are second- as they can be tested in parallel. The last tests performed are the temperature sensitive adjustments- I want a radio that has been powered-on for 2-3 hours... I will sell no wine before its time! Relax - It all goes back together- It always does! There are no parts left over! Never! Do not use WD-40 on anything! You cannot afford THAT repair! If you think this looks bad- wait till I show you the front panel removed! !! BEWARE !! HIGH VOLTAGE ALERT !! Be aware that a basic alignment even with the safety covers on will expose you to high voltages! It is imperative that only non-metallic and non-ferrous alignment tools be used and that all safety covers remain in place. 365 volts is present on the alignment capacitors (behind the protective covers!) and 750 volts is present in the high voltage section. The Fluke multimeter and all test leads are rated for 1000 volts. 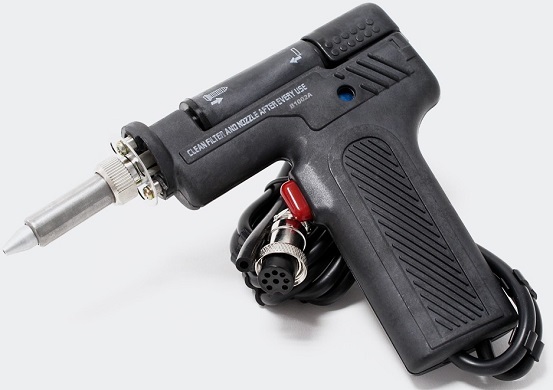 I have a 5,000V high-voltage oscilloscope probe designed exclusively for high voltage measurements. You cannot use bargain-basement or free-with-coupon test equipment on your FT-101. These may be automotive-rated with a 60V maximum working voltage. Do not put a H.F. or Bargain-Bob's meter anywhere near these radios! High Voltages are present anytime the radio is powered ON. The Heater switch only controls 12V to the tube filaments. Even with the radio OFF, there are mains voltages (100+ volts) on the rear panel. The FT-101 has a split power transformer which is powered anytime the radio is plugged in. It takes 3-minutes to bleed the 750V power supply down to under 12 volts. 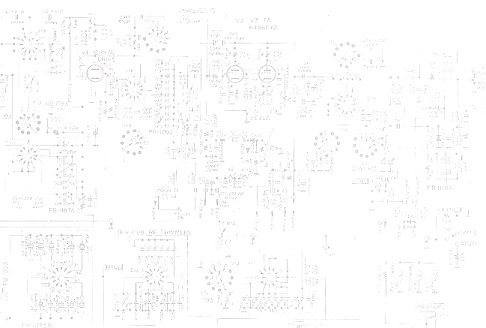 For some reason Yaesu designed the FT-101 with split TX and RX voltage rails. The TX voltage to the VFO must match the RX voltage to the VFO. Additionally, the Clairfier must match at the zero "0" indicator. Wow- three controls! Adjust the precision 6V regulator to 6.000 volts before you begin! 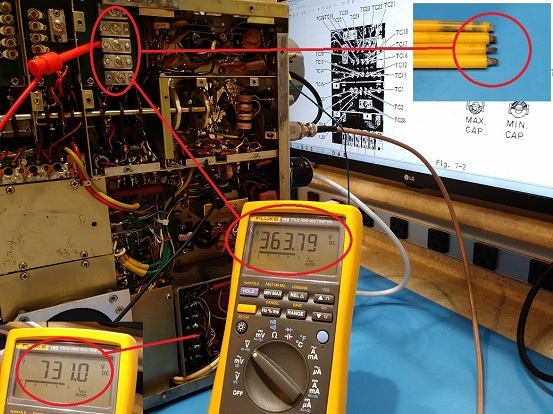 A calibrated Fluke multimeter makes easy work of these adjustments. One adjustment is behind the Clairifier control itself. The other is accessible from the top (Zero Control Pot on the Regulator Board). If the covers are off, you can use the voltage method shown here. If the covers are on, you can use the frequency-method and listen to the VFO frequency on another radio. Can you get ±10 Hz...? Yes you can. Always perform this alignment on a warm radio! Never cold. From time to time, boards that are 43+ years old will need parts replaced in bulk. In bulk, I mean every capacitor! Such is the case with the Audio Board. This is a high parts count board. 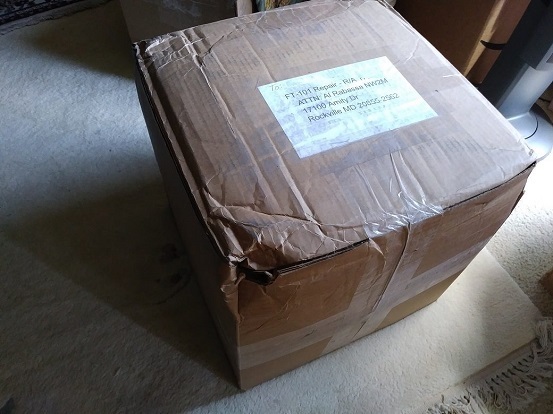 Ebay offers little help. Never buy another board and take on another person's problems! Why buy another 43-year old board? You already have one! You do not need two!! Keep a numbers-matching radio and let me replace those old and cracked parts. This is why I insist on double-boxing your valuable FT-101 radio! Your radio is both heavy and delicate. Steel with glass tubes. A properly packed FT-101 will tip the scales at 40 lbs. About every 10th box I receive looks like this. Properly packed, the radio always arrive without a scratch. The packing must survice a round-trip... so do not skimp on packing! This box is history.